We’re off to Columbia Road flower market tomorrow for breakfast with friends and to enjoy the sun (and hopefully my boyfriend will buy me lots of pretty flowers!). 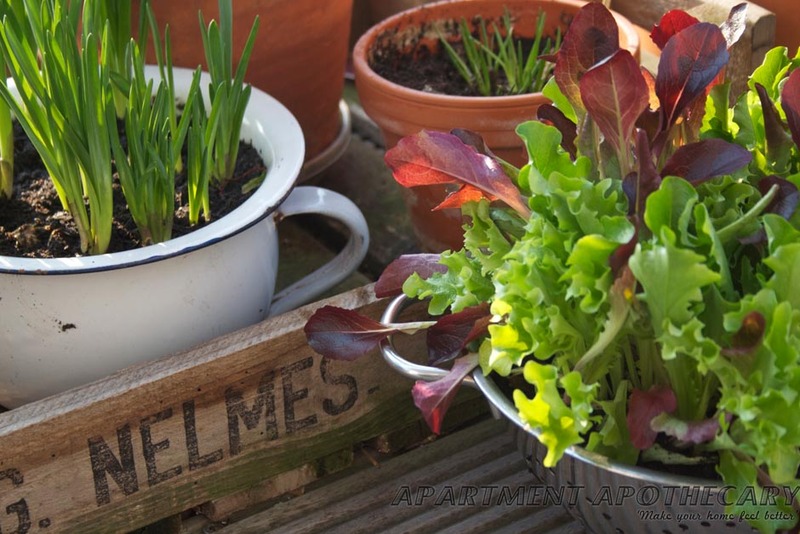 Now that the weather is improving I’m turning my attention towards the garden; my seedlings are coming on and I’m collecting ideas for planters. I try to design my balcony in the same way as my flat: I can’t, and don’t want to, rush out and buy everything new. This way my outdoor space reflects my style and doesn’t cost me a fortune. 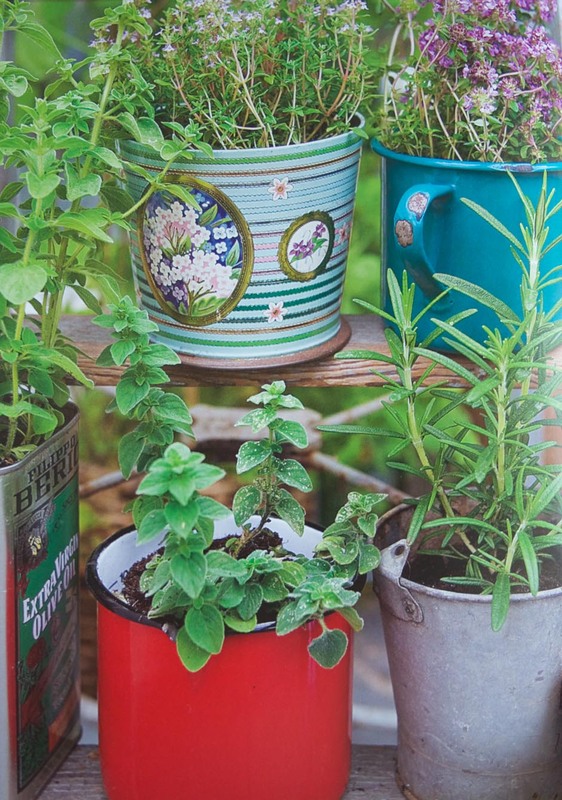 One of the easiest ways for me to achieve this is to recycle vintage finds and old tins into planters. 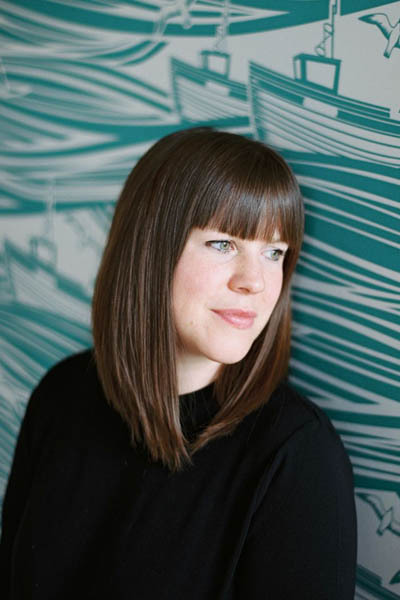 This is so easily achievable and I bet if you do a really quick scan of the room you are sitting in right now you, too, will be able to find something that could be re-purposed as a planter, rather than buying brand new ones. I promise you that once you start gardening, you won’t be able to stop. Either use what you already have, go to charity shops, use eBay or start collecting old food tins. Keep a look out for: vintage tins, bread bins, enamel pots or cups, colanders, tin jelly moulds, cake tins. You need to do a little research to ensure that what you plant will be happy in pots. Herbs are a good place to start as they are very hardy and don’t need much root space, bulbs also do well in small containers. If you want a quick and easy start, buy the pots of herbs from your local supermarket. You need to ensure that the containers you use have drainage holes. 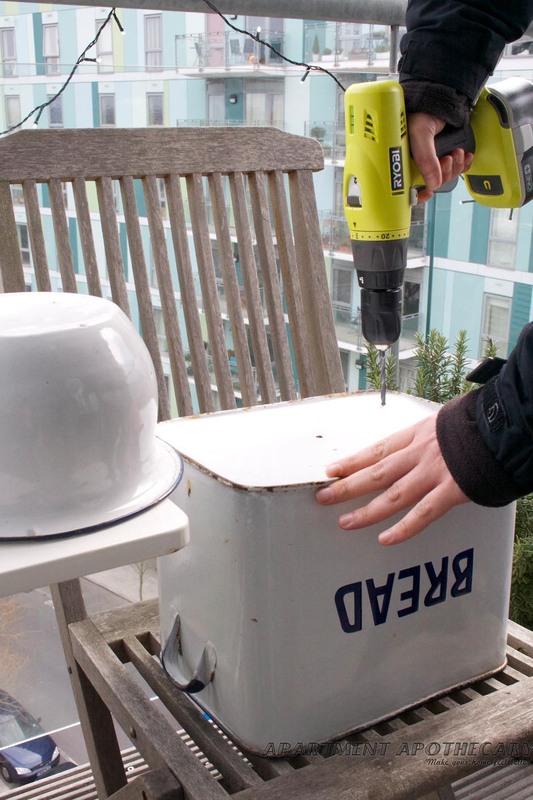 You can drill holes (as you can see below) or for small containers just use a hammer and nail. If you buy an established plant you may be able to place it in your plant holder without the need to re-pot it, as long as it fits. 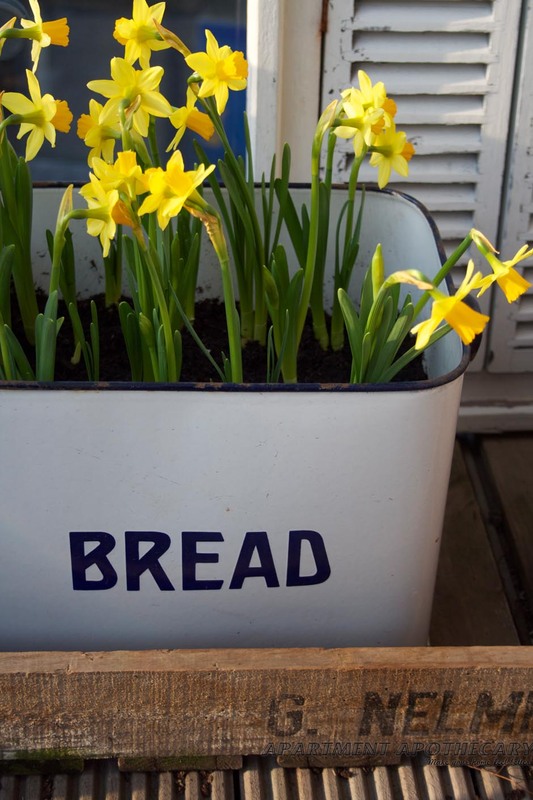 My vintage enamel bread bin, with a lost lid, used for daffodils. Enamel cooking pot used for strawberries, enamel cups for thyme and mint, and an olive oil tin for mint (that you can buy at the supermarket). An old, large wicker basket is also used for a bean plant. Photograph from The Edible Balcony. 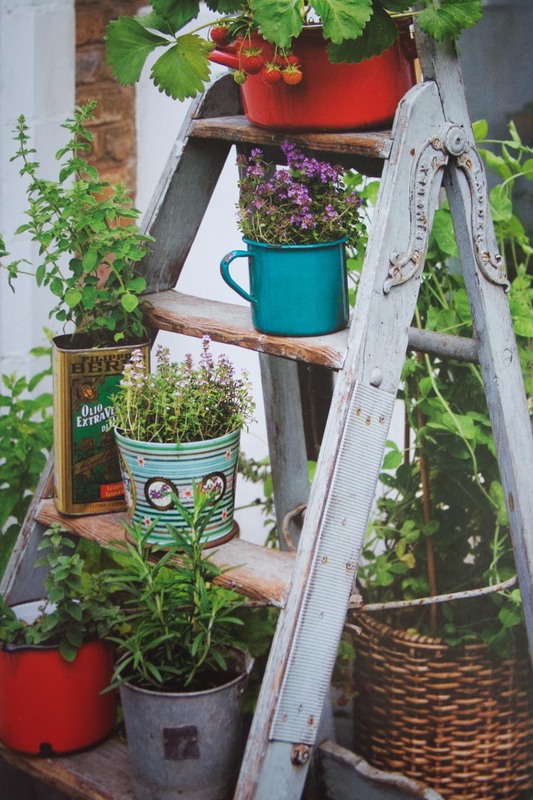 I love the idea of arranging pots on a ladder. I’m still waiting for my bluebells, planted in this Victorian enamel potty, to bloom. 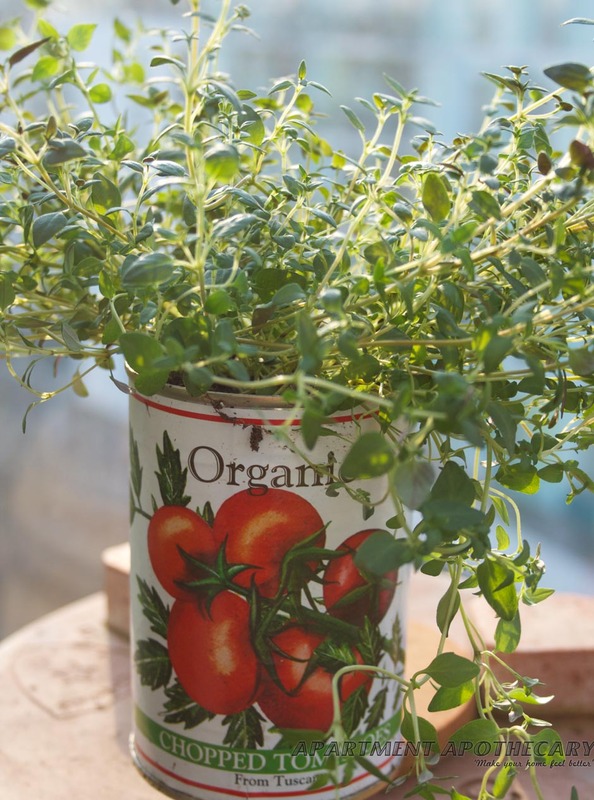 I’ve planted thyme in this old food tin. 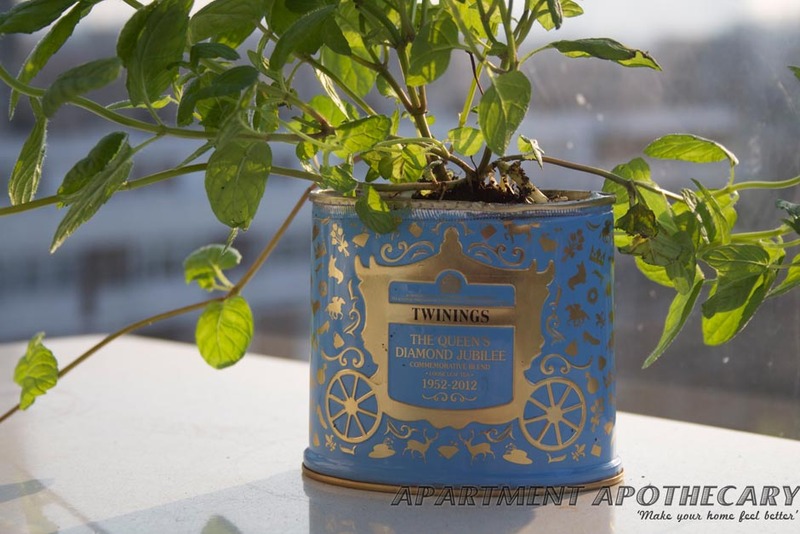 Mint in a tea tin. Mint is best kept in pots as it is so voracious and can overrun a bed. It’s such a nice thing thing to have a ready supply of in the summer for cocktails and Pimms. 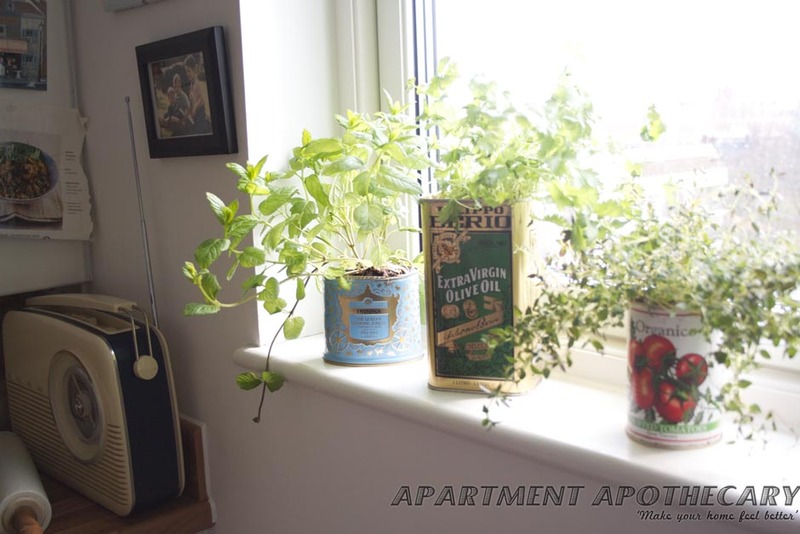 Tea tin for mint, olive oil tin for coriander, tinned tomatoes tin for thyme. I hammered a nail through the bottom of each tin for drainage. Start collecting food tins that are aesthetically pleasing. 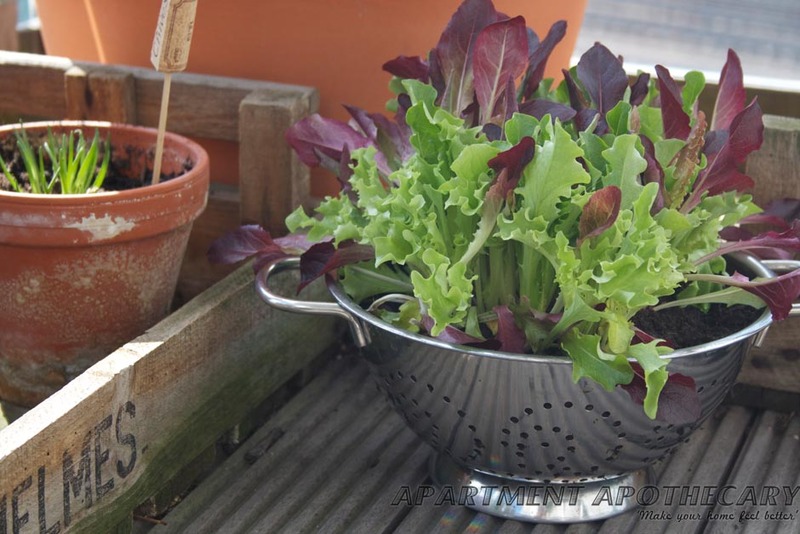 A colander makes a perfect planter for lettuce as it needs lots of drainage. I bought this ‘growing’ lettuce from the supermarket and it is so easy to look after. 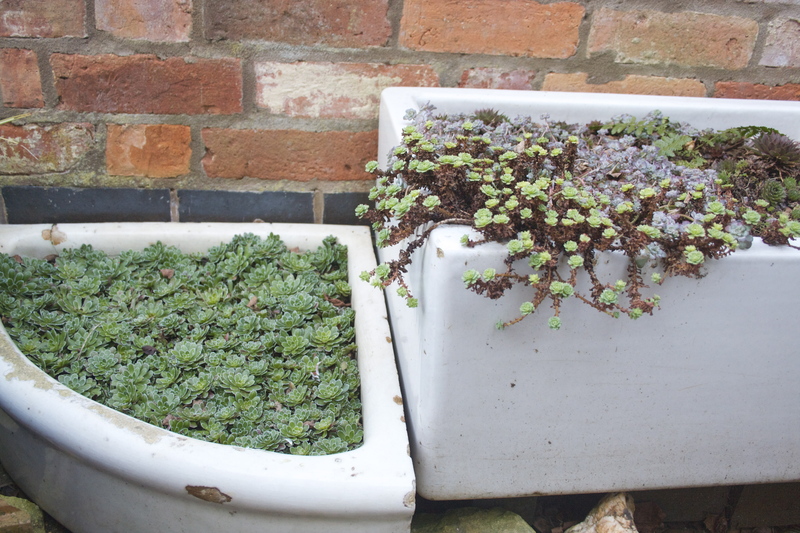 My boyfriend’s mum has these amazing butler’s sinks in her garden full of pretty succulents. Love them! All of these herbs can be left outside or put on a windowsill in the kitchen so they are easily accessible, whilst cooking. Photograph from The Edible Balcony. Look how sweet this is. 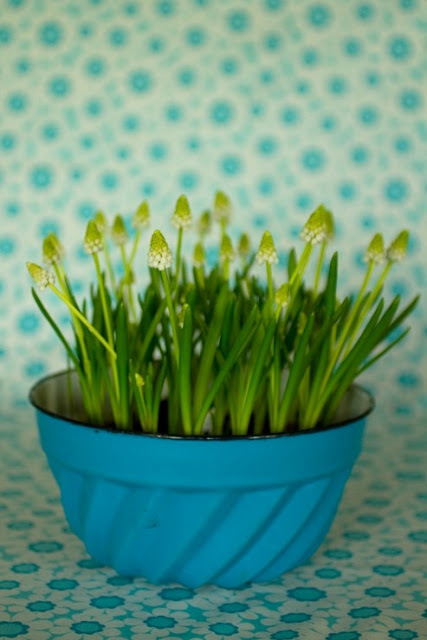 Grape Hyacinths can be packed into any old containers as with all bulbs they don’t actually need soil to grow as their bulbs are packed with all the nutrients they need to grow. Photograph from Saidos da Concha blog. Some lovely ideas as always. I’ll be stealing a few! We found some of the same enamel cups in our house and I also raided the cellar and found some old wine crates – too ‘rustic’ for indoors so I’m going to line them with plastic and make plant pots for the terrace. Miss Sunday outings to Columbia Road. 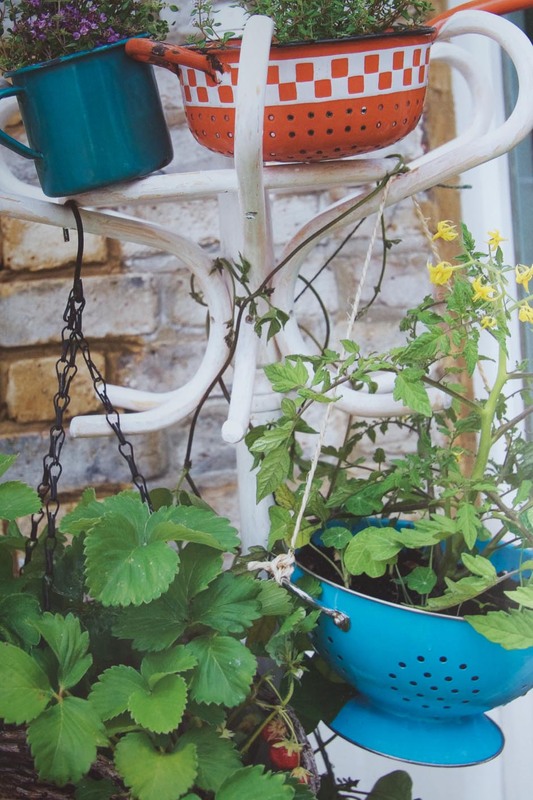 Will definitely use my old wrought iron saucepan stand to show off any herbs or plants. People keep asking me why i have kept it. Thanks to you – now I know! Thank goodness I came across your lovely pictures – I was just about to buy something very boring and you’ve made me stop and think about doing something much more interesting.